The composite oral fluids sample from the rope should represent the majority of animals in a pen. See DATCP’s information website at https://www.aasv.org/shap/issues/v22n3/v22n3p138.pdf . *Keep in mind that the antibody PRRS ELISA test will likely be POSITIVE for vaccinated animals. It is also possible that oral fluids from pigs feeding on diets supplemented with spray-dried plasma of porcine origin may test POSITIVE on the PRRS ELISA due to the presence of PRRS virus antibodies in the porcine plasma supplement. Two cases of EEE have been diagnosed at WVDL this week. Both cases were from Northern Wisconsin in Crandon and Eagle River. See below for the press release from DATCP. Please contact the WVDL for any questions for testing or management of EEE in horses. MADISON – A 2-month old unvaccinated filly from Forest County is the first reported Wisconsin horse to have become infected with Eastern Equine Encephalitis (EEE) this year. The filly was euthanized on August 23. “Northern Wisconsin has good mosquito habitat. It’s also been a very wet summer up north, which contributes to the problem,” says Dr. Julie McGwin, equine program veterinarian for the Wisconsin Department of Agriculture, Trade and Consumer Protection. EEE is caused by a virus transmitted by mosquitoes, and may cause encephalitis, or inflammation of the brain, and is fatal to horses in 90 percent of cases. Symptoms in horses include depression, appetite loss, drooping eyelids and lower lip, fever, weakness, twitching, paralysis or lack of coordination, aimless wandering, circling and blindness. The virus is not contagious between horses, but can be carried by mosquitos from an avian, or bird, host to horses and humans. While humans may also be infected by EEE, the virus does not pass directly between people and horses. Mosquitoes biting warm-blooded animals is the only route of transmission. Horses that have not already been vaccinated this year for EEE or other mosquito-borne diseases are at greater risk. “Those horse owners who have vaccinated should check with their veterinarians to see whether a booster is appropriate,” McGwin said. Horses that have never been vaccinated will need two doses two to four weeks apart, and the vaccine will take at least two weeks to build up enough antibodies to protect them. Vaccines will not protect horses that have already been infected when they receive the injections. Vaccines are available that protect against other strains of equine encephalitis along with EEE, and a separate West Nile virus vaccine is also available. Wisconsin last experienced a major outbreak of EEE in 2011, with more than 30 cases mostly in north central Wisconsin. Since then, sporadic cases have occurred. Because EEE follows mosquito populations, it normally occurs beginning in mid- to late summer and remains a threat until the first killing frost. The USDA recently reported finding highly pathogenic H5N2 avian influenza (HPAI) in a wild mallard duck in Alaska. No human infections have been reported with this finding and USDA has not reported an HPAI H5 infection in the USA since June of 2015. Because Alaska is a common area for migratory birds in the flyways, bird owners and veterinarians should be at an increased awareness level for the upcoming migration south. See below for the official release from USDA APHIS. The United States Department of Agriculture’s (USDA) Animal and Plant Health Inspection Service (APHIS) has confirmed the presence of highly pathogenic H5N2 avian influenza (HPAI) in a wild mallard duck from a state wildlife refuge near Fairbanks, Alaska. CDC considers the risk to the general public from these HPAI H5 infections to be low. No human infections with Eurasian H5 viruses have occurred in the United States. As a reminder, the proper handling and cooking of poultry and eggs to an internal temperature of 165˚F kills bacteria and viruses, including HPAI. H5N2 HPAI has NOT been found in the U.S. – in either wild or commercial birds – since June 2015. However, anyone involved with poultry production from the small backyard to the large commercial producer should review their biosecurity activities to assure the health of their birds. 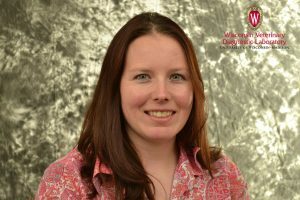 To facilitate such a review, a biosecurity self-assessment and educational materials can be found at https://www.uspoultry.org/animal_husbandry/intro.cfm. Since wild birds can be infected with these viruses without appearing sick, people should minimize direct contact with wild birds by using gloves. If contact occurs, wash your hands with soap and water and change clothing before having any contact with healthy domestic poultry and birds. Hunters should dress game birds in the field whenever possible and practice good biosecurity to prevent any potential disease spread. Biosecurity information is available at: https://www.aphis.usda.gov/publications/animal_health/2015/fsc_hpai_hunters.pdf. In addition to practicing good biosecurity, all bird owners should prevent contact between their birds and wild birds and report sick birds or unusual bird deaths to State/Federal officials, either through their state veterinarian or through USDA’s toll-free number at 1-866-536-7593. Additional information on biosecurity for backyard flocks can be found at https://healthybirds.aphis.usda.gov. What is the time course of infection? Specific infection studies have not been conducted with the new H3N2 Canine Influenza Virus strain circulating in the U.S., but based on other influenza viruses more generally, incubation period is expected to be 2-3 days, with clinical signs lasting 5-7 days and viral shedding extending to 21-24 days following the onset of clinical disease. What general recommendations and information can I provide to clients? Vaccinate dogs when possible, despite unknown efficacy of current H3N8 commercial vaccines to prevent or diminish clinical disease with the new H3N2 virus. To the best of our knowledge, the original H3N8 virus has not disappeared, but is NOT circulating in Wisconsin. Maintain good general infection control principles when exposed to other dogs (e.g., limit direct dog-to-dog oronasal contact). Soap and water is very effective at inactivating virus. The virus will live in the environment for 24-48 hours in the majority of cases. Wash your hands and change your clothes if you work with or are exposed to sick dogs before handling your own pets at home. This also applies to veterinarians in practice. What samples should be taken and how is testing conducted? The sample requested is a nasal swab with a non-cotton swab. Please use Dacron or synthetic swabs. Break the swab off into viral transport media. The Wisconsin Veterinary Diagnostic Laboratory (WVDL) offers broadly targeted matrix rt-PCR testing for CIV for veterinarians and their clients. The cost is $33 with a $10 accession fee. WVDL also offers a respiratory disease rRT-PCR panel “RESPPNLK9.” This tests costs $100.10 with $10 accession fee and includes Canine distemper virus, Canine herpes virus, Canine parainfluenza virus, Canine respiratory coronavirus, Canine adenovirus 2, Influenza A, and Bordetella. All supplies required can be acquired from the WVDL within 24 hours and shipping via UPS is recommended. Try to schedule dogs with compatible clinical signs at the end of the day to minimize exposure to your regular clinic in- and outpatients. Have owners keep dogs outside the clinic until you are ready to see them. Consider alternative paths in/out of the clinic, and generally keep dogs with clinical signs away from regular clinic in- and outpatients. NOTE: Please notify DATCP if you have a positive test from a diagnostic laboratory that is notWVDL. The WVDL automatically notifies DATCP. WASHINGTON, April 13, 2015 — The United States Department of Agriculture’s (USDA) Animal and Plant Health Inspection Service (APHIS) has confirmed the presence of highly pathogenic H5N2 avian influenza (HPAI) in a commercial layer flock in Jefferson County, Wisconsin. The flock of 200,000 chickens is located within the Mississippi flyway where this strain of avian influenza has previously been identified. CDC considers the risk to people from these HPAI H5 infections in wild birds, backyard flocks and commercial poultry, to be low. No human infections with the virus have been detected at this time. 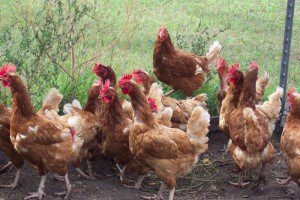 Samples from the chicken flock, which experienced increased mortality, were tested at the Missouri Department of Agriculture Veterinary Diagnostic Laboratory and the APHIS National Veterinary Services Laboratories (NVSL) in Ames, Iowa confirmed the findings. NVSL is the only internationally recognized AI reference laboratory in the United States. APHIS is working closely with the Wisconsin Department of Agriculture, Trade and Consumer Protection (DATCP) on a joint incident response. State officials quarantined the premises and birds on the property will be depopulated to prevent the spread of the disease. Birds from the flock will not enter the food system. The Wisconsin Department of Health is working directly with poultry workers at the affected facility to ensure that they are taking the proper precautions. As a reminder, the proper handling and cooking of poultry and eggs to an internal temperature of 165 ˚F kills bacteria and viruses. All bird owners, whether commercial producers or backyard enthusiasts, should continue to practice good biosecurity, prevent contact between their birds and wild birds, and report sick birds or unusual bird deaths to State/Federal officials, either through their state veterinarian or through USDA’s toll-free number at 1-866-536-7593. Additional information on biosecurity for backyard flocks can be found at https://healthybirds.aphis.usda.gov. Dr. Mark Carlson, a pathologist at the WVDL in Barron, retired on January 7th, 2015. Dr. Carlson started with an earlier iteration of the WVDL in June 1984 and has worked for the pathology sections in both Madison and Barron. All of us at the WVDL want to thank Dr. Carlson for his 30+ years of exceptional service to the laboratory and its clients in and around the State of Wisconsin. Mark’s long time work through the evolution of the WVDL has earned him the respect of clients and coworkers. Mark and his wife, Rene, are excited to finish and spend a significant amount of time on their sailboat in the Caribbean Sea. Please contact the WVDL with any questions regarding avian influenza in your flock or individual birds. Our diagnostic laboratory is fully equipped to test for avian influenza with rapid turn-around time. No immediate public health concern has arisen from this outbreak. The best samples are those that are collected within 4-8 hours of the animal’s death. Delays in sample collection decrease the probability of obtaining useful diagnostic information. Veterinarians should submit both fresh and formalin fixed tissues from any organ that has gross lesions. See chart below for information on tissue types and how tissues should be collected and submitted to WVDL. *Since the formalin jars tend to leak; please place the formalin jar inside a Ziploc® bag. If it is not possible to place the tissues in formalin at the time of sample collection, WVDL staff will do it for you. Please keep in mind the tissue samples will be more autolyzed and less diagnostic for histopathology when formalin fixation is delayed. 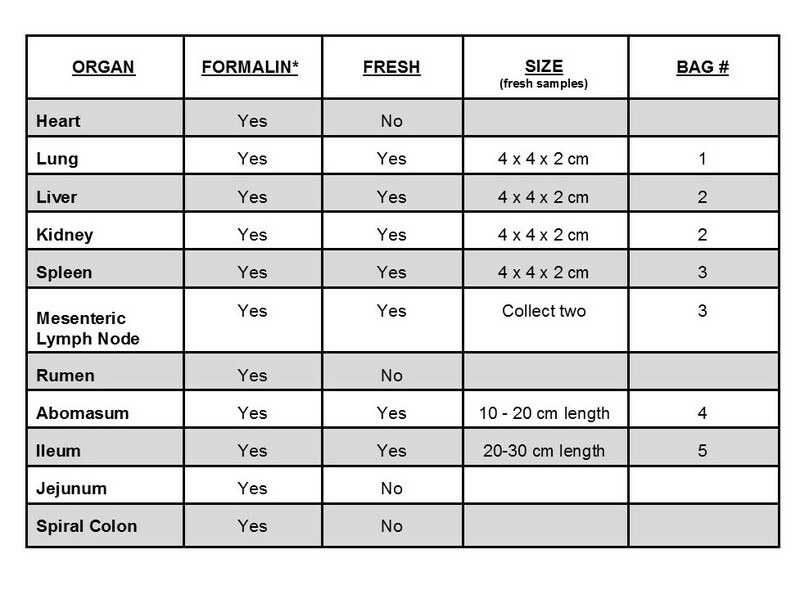 A 2 x 2 x 1 cm piece of tissue from all the organs listed below should be placed in formalin. The ratio should be 9 parts formalin to 1 part tissue for proper fixation. The WVDL recommends using a 16-ounce wide-mouthed jar that contains 8 ounces of 10% buffered formalin (Fischer catalog # 23-426-797). Veterinarians should completely fill out the WVDL General Submission Form which includes the age of the animal. An electronic copy is available at www.wvdl.wisc.edu. Click on the forms link to download the submission form. The laboratory should receive the samples within 24-36 hours. See our website for discounted, expedited shipping options. Package the samples with a sufficient number of ice packs to ensure they remain cold during shipment. Clients should schedule shipments to avoid weekend and holiday delivery of samples to the laboratory.